Do you want to use your education to make positive change in people’s lives? The Mercer Honors Program is an enriched college experience for highly motivated and intellectually curious students with a commitment to cultivating complex understanding and innovation in their chosen fields. It's not a separate track or major; honors students matriculate into an MCCC degree program and take one or more honors courses each semester toward fulfillment of their general education and program requirements. 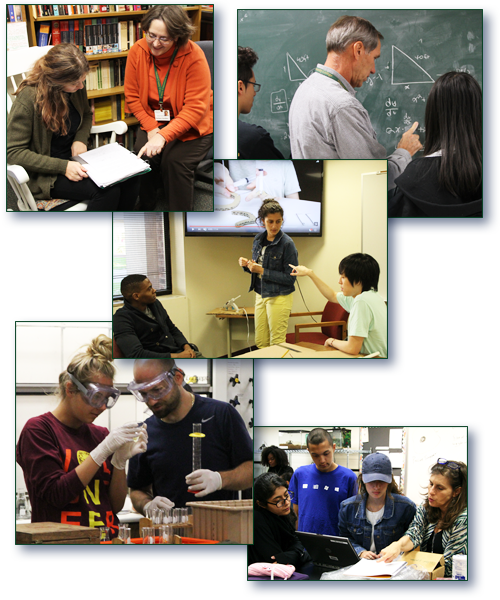 Students have access to a range of honors courses in biology, business and technology, chemistry, composition, humanities, mathematics, and social sciences. These courses prepare students for junior- and senior-level coursework at some of the best colleges and universities in the nation, and the distinction of honors course work shows clearly on students' transcripts. Join an academically engaged and motivated community of scholars. Gain a competitive edge as a transfer applicant from the honors experience. Participate in smaller student-driven and discussion-based seminar classes where everyone has a voice. Expand abilities in courses that go deeper and challenge students’ critical thinking. Develop creativity through collaborative and individual projects. Work with committed, full-time honors faculty who are accessible in and out of class. Learn about leadership opportunities on campus and clarify your academic path at Mercer and beyond with transfer advising. Honors courses prepare students to pursue an array of transfer options after Mercer according to their goals. Some students want a larger university, some a smaller college. Some want to stay in-state and some want to go out-of-state. In addition to MCCC’s tuition per credit, there is an honors fee of $40 per credit for each honors course. Financial aid and scholarships are available. The Mercer Honors Program provides a pathway for students who seek the challenge of one or more honors courses each semester and want to be part of an honors peer community. Mercer Honors Program students take a portion of their academic program's required courses as honors courses. MCCC is Moving You Forward! Click here for information on the MCCC Student Conference April 2019. Is the Mercer Honors Program right for you? Try the short "self-evaluation" below. I do assigned readings/homework and come to class prepared. I want to figure things out more than just remembering them, or looking them up. I can embrace working with peers whose worldview may be different than my own. I am good at working independently and following through on academic projects. I am a strong reader. I am a fairly confident writer. I am curious about a lot of subjects. I believe in being a proactive, initiative-seeking person. I like sharing my ideas with others or am ready to work on presenting my ideas more. I welcome an interesting challenge. I am willing to take risks and try new approaches when I learn. If six or more of these describe you, then consider applying to the Mercer Honors Program!